Kahakai Kitchen: Opa! Kahakai Kitchen is Hosting My Big Fat Greek Wedding for February's Food 'N Flix! Opa! Kahakai Kitchen is Hosting My Big Fat Greek Wedding for February's Food 'N Flix! I am thrilled to be hosting Food 'N Flix for February! 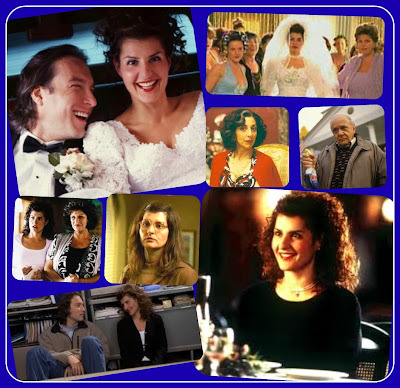 Even better, I picked one of my favorite feel-good romantic comedies with a foodie touch, My Big Fat Greek Wedding. make Greek babies, and feed everyone... until the day we die. You may have watched this fun movie multiple times like me, but if you haven't seen it, My Big Fat Greek Wedding is the story of Toula Portokalos, a frumpy, single 30-year old woman who mans the cash register and coffee pot in her family's Greek diner. Toula longs for more in her life but her father Gus just wants her to find a nice Greek husband and start having kids. Toula's mother Maria helps convince Gus to let Toula take computer classes at the local college and Toula's world begins to expand--she starts dressing up, wearing make-up and even exchanging her glasses for contacts. Her mother and her aunt Voula help get her out of the diner and Toula starts running her aunt's travel agency where she meets teacher Ian Miller and falls in love. The problem? Ian is not Greek, comes from a small, quiet, tightly-laced WASP family and (horrors!) is even a vegetarian! Can Toula and Ian deal with the clash of cultures and the interference from her huge, loud Greek family while planning that big fat Greek wedding? Grab a copy of this movie to find out and enjoy lots of food, family, romance and fun! Make your favorite Greek dish or a recipe you have always wanted to try. Maybe a cake--flower pot in the center optional. Roast some meat perhaps? Wait... You don't eat no meat?! ...That's OK, make lamb! Watch the chosen film (My Big Fat Greek Wedding). Taking inspiration from the film, head into the kitchen and cook or bake or make something. I think I must know every line to this movie...but I'll take any excuse to watch it again! Opa!! I love this movie too and will make it a point to participate this month. Perfect. I love Greek food and I love Greek weddings. I already know what I'm going to make.. and lamb is involved! Love the movie - count me in!